June 28, 29, 30 – July 01, 1995. SR wrote: “Richard Harris is razor sharp with his characterisations in Outside Edge. From the myopic Roger to the utterly confused Bob, all his characters are wonderfully written. 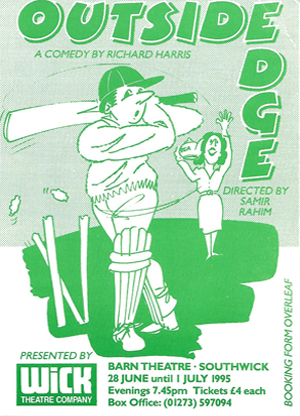 This play is more than a light breeze through a Saturday afternoon game of cricket. It talks of relationships and the breakdown of communication. It deals with age and the constant battle between manhood and its responsibilities and the pursuit of youth and its frivolities. His wit and humour aids us to share, feel and indeed accept the players’ failings even through the cruelest [sic] actions and comments. I am guilty of watching one episode of the TV series and am happy to say there is no comparison between this production and that one. We have a fast paced, hilarious trip into the territory of Roger as he guides his team to the toughest task yet – pitching his men against the opposition of the combined and slightly more than belligerent might of the British Railways [Maintenance Division], Yeading East! I would like to thank the Wick Theatre Company for this opportunity to direct with them. My thanks to the cast and crew and all those members who offered their services so willingly. “Samir Rahim obtained a Bachelor of Arts degree in Theatre Arts from America where he had the opportunity to direct and act in a variety of productions. Among the most memorable are Caucasian Chalk Circle, Oedipus Rex, Orchards and Prelude to a Kiss. He had the distinction of writing and directing A Family Affair which won the American Arts Festival for the New England Area and, later that year he was rated in the top ten per cent of College Actors for 1991.